On Tuesday, a kickstarter campaign was launched to build a ‘mouth operated gamepad, mouse and keyboard for quadriplegics’. Quadriplegia affects the nervous system, making it difficult for people to move their limbs, to the point that they can be paralysed. Such people have trouble playing video games which often require a keen sense of tactile perception. To try and fix this an aerospace engineer called Ken Yankelevitz came up with the idea for a game controller for Quadriplegics, it was called the ‘Quad Controller’. However, around October last year he stopped accepting orders for repairs or new devices due to health reasons. 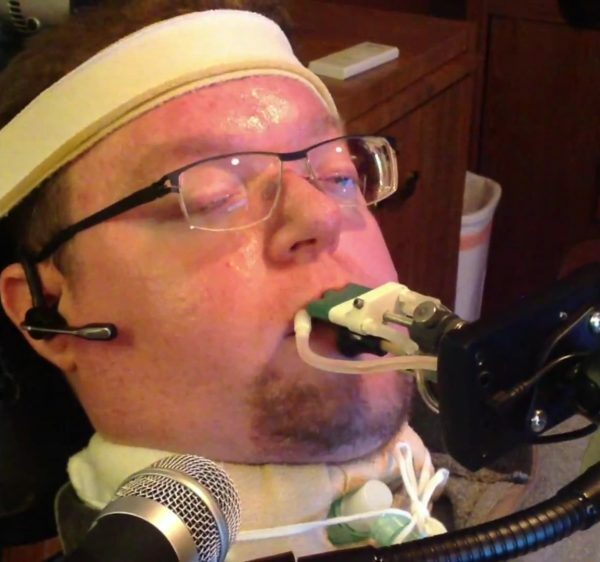 Without him the current stock of Quad Controllers will have slowly fallen into disrepair, and this would have left the Quadriplegic community unable to play video games had it not been for the initiative of designer Fred Davidson, who decided to build a new ‘Quadstick‘ to replace the old Quad Controllers. Davidson was looking for $10,000 (~£6,000) to fund the controller and with 25 days left to go he’s already raised way beyond his target budget. Given that it’s already funded this doesn’t need any more money to be realised, but it still deserves to be publicised simply because it’s a good project. For anyone who wants to buy one the Quadstick is on a $400 (~£240) reward tier, here’s the link to it again. If you don’t need one personally but still want to contribute lots of money, Davidson suggests buying a Quadstick and shipping it to Able Gamers who will then distribute it to “a worthy disabled recipient”. Alternatively, there’s an accessible game centre in Witney, so if you’ve got disposable income to go towards local accessible gaming related causes, I’m sure they could do with some donations. The Quadstick promises to be compatible with Windows and Android devices; for games consoles it supports the PS3 out of the box and can connect to the Xbox 360/Xbox One through an adapter. The first units are expected to ship to backers in May.